The Parade area was also known as the Market or the Market Square. It was immediately east of the Great Bridge. Arthur Fenner’s business locations were on the north and east of the Market. The Sabin tavern was on the north east corner of the Market. The Brown brothers had several business locations, but the home of John Brown was then a little south of the Market. 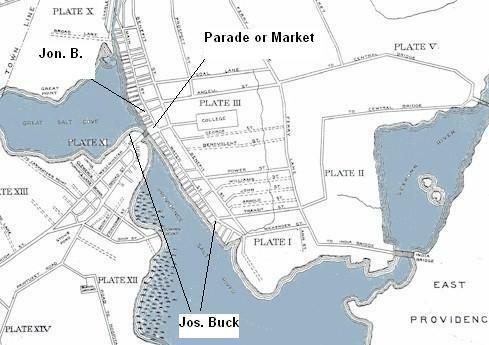 Joseph Bucklin had buildings and wharfs at about the two locations indicated. The major business location of Captain Joseph Bucklin, with the dwelling house, was near the center of the city, on the west side of the Great Bridge . Thus Joseph Bucklin was close to the home of the planner of the attack (John Brown’s home) , the place where men gathered for the attack (Sabin tavern) and the place from whence the longboats left for the attack (Fenner’s wharf). Jonathan Bucklin had his tavern at about the location indicated, which was later the Olney tavern. It would be about 5 miles from the center of Providence of 1770, east across the Seekonk River by the Central Bridge, to the major Bucklin family lands in Pawtucket. The north boundary of East Providence today was the south edge of Bucklin family lands. The original lots of the Roger Williams group were narrow strips of land that ran down the steep hill to the Providence River. As there became more people, and a greater demand for house lots, the rear end of the original lots had property taken from them to become a street running parallel to Main Street. At the same time there was a general filling of land at the bottom of the strips, to provide flat land for riverside commerce. A new street was made near the water, and since it apparently made sense to the people of the time, the original Water street became a consistent “Main Street” though its entire length. The street at the top of the hill was first sensibly named Back Street, but soon became today’s “Benefit Street”. In 2000, the original bridge from the middle of the Market across the River to a straight street named Westminster no longer exists. The new bridge location made a shift in the end of Westminster. Therefore, if you want to locate the area in which Joseph Bucklin 4th had his home and shops, you need to go straight down the westerly leading street, from the east side of the river, to the river and look straight in line with that street across the river. Line up some points and go across the present bridge. Find the points you have lined up and walk westerly from the river about 200 feet or so. Another help to finding correlations between a 1798 map or a 1770 map is to note that the present Old Custom House building stands at the point that would have been the approximate end of the original “Long Wharf” shown in the maps of the 1700’s. A national history center both for the Gaspee Affair of 1772 and also for Bucklin History 1600-1899. We emphasize the pre-Revolutionary history of Massachusetts and Rhode Island and the events and people involved in the Americans' 1772 attack on the Royal Navy ship Gaspee. We maintain a 4,000 person biography and genealogy database and history for the Bucklin family.